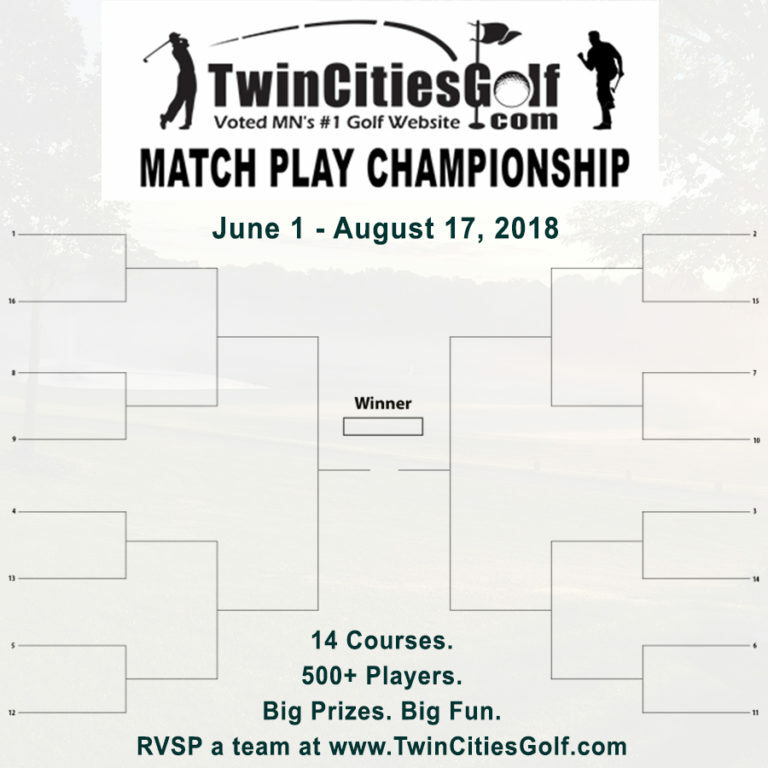 Experience the excitement of team match play with the TwinCitiesGolf.com Team Match Play Championship. 1. Format is 2-Person Teams playing team Best-Ball Match Play (individual stroke per player with lower of 2 scores being your “team” score). Must register as a 2-Person Team. The registration cost is $20 per team. Maximum of 16 teams per flight per course. 3. TCG creates the brackets and teams communicate with each other to setup their matches. Public Country Club members may use their PCC membership for greens fees during matches. Non-PCC members simply pay greens fees at time of each round. 4. The maximum team combined handicap to enter is 29 and 3 flights will be created based on combined team handicap (Flight A, Flight B, Flight C). A 2018 Active USGA GHIN handicap is needed to validate your handicap (with a minimum of 5 scores posted within the last 10 months). NOTE: If the handicap difference between playing partner handicaps is 8.0 or more, that team will be moved UP 1 flight and if one playing partner is a 3.9 or less handicap, that team will automatically be in the A flight. The maximum difference between player handicaps is 12.0. Need a GHIN handicap? CLICK HERE to purchase then post 5 past rounds before JUNE 1 to qualify. 5. For each round, teams will have a 15 day window to complete their match. 6. The winning team from each flight at each course will advance to Championship round against winning teams from the other courses. Winning teams will receive TCG gift cards as prize money (based on total prize pool). TCG credits can be used for TCG events, 2nd Swing gift cards or VISA gift card redemption. >>To RSVP a team, CLICK HERE and complete the form. No cost to RSVP…the $20 per team registration fee (for the prize pool) is payable once your course selection is confirmed.